"All the evidence suggests that women do find this incredibly intimidating and distressing and we think it constitutes a form of street harassment. It's all very well for them to say 'we're peaceful', and that might be the case, but women approaching don't know that, they don't know who these people are. You have to understand that women generally are nervous about public places or can be nervous if they see a group of strangers." Express disappointment in the way in which the article misrepresents 40 Days For Life. Request that the article in its current form be removed from the BBC website. 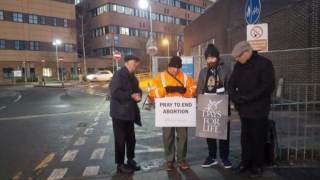 Request that the BBC redress the balance by featuring an article where women who have been helped by groups like 40 Days For Life and the Good Counsel Network are allowed to present their story.